It’s January so I’m reminding you of some low-carb dinner options you might have missed like I do every year! If you like sausage and peppers and the cheesy goodness of lasagna, you’ll love this Low-Carb Sausage and Roasted Peppers Mock Lasagna Casserole! This delicious mock lasagna is also low-glycemic, and gluten-free. Use the Diet-Type Index to find more recipes like this one. 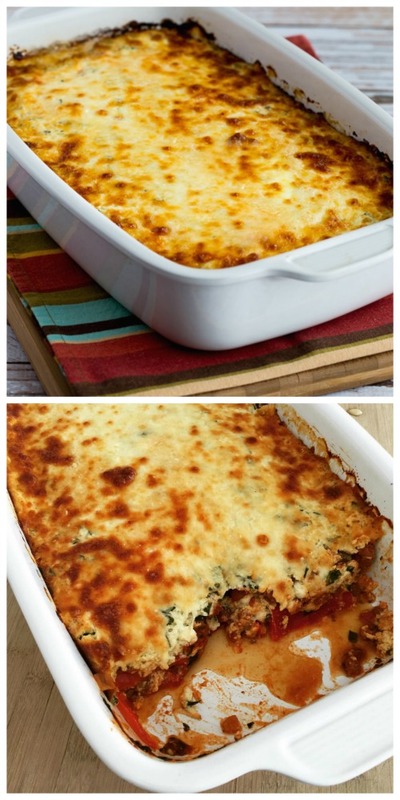 Click here to PIN this tasty sausage and roasted peppers mock lasagna! 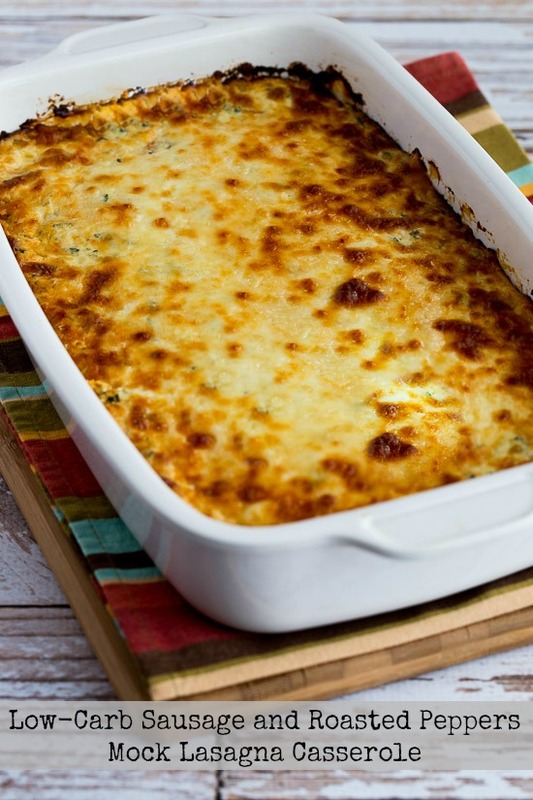 Low-Carb Sausage and Roasted Peppers Mock Lasagna Casserole. This Low-Carb Sausage and Roasted Peppers Mock Lasagna Casserole was one of those low-carb comfort food ideas that just popped into my head, but it was definitely inspired by my friend Lydia’s Slow Cooker Sausage and Four Cheese Lasagna. 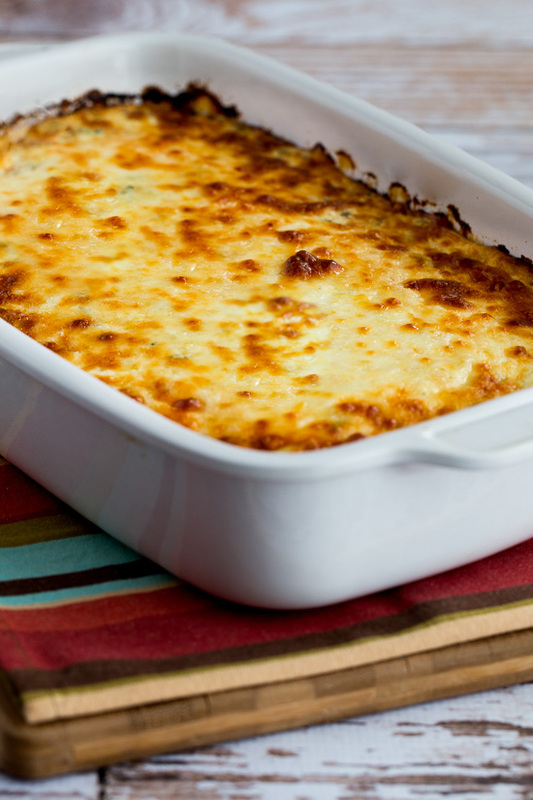 When I made that recipe for our family Christmas party (using my Casserole Crock Pot) it was a huge hit, which got me thinking about a low-carb mock lasagna casserole with those same lasagna flavors but using a low-carb ingredient to stand in for the noodles. I first tried this recipe idea of a mock lasagna with Jake, adapting Lydia’s homemade sauce a little and using roasted red peppers from a jar to replace the noodles. It was good, but I thought it could be improved, so the next time I cooked with Kara we made it again, making the sauce with lots of hot Italian sausage and using fresh red peppers that we roasted in the oven. If you absolutely don’t have the time or desire to roast your own red peppers, go ahead and make this delicious low-carb mock lasagna with roasted red peppers from a jar and it will still be wonderful. But if you can take the extra time and roast red peppers in the oven, that takes the recipe to a whole new level of deliciousness! First make the sauce and mix the cheese. Squeeze hot turkey Italian sausage out of the casings and brown in a little olive oil; when it’s brown add the finely diced onion and minced garlic and cook a few minutes more. Add the crushed tomatoes, diced tomatoes, tomato paste, Dijon mustard (Lydia’s secret ingredient), Italian Sausage seasoning, and a few tablespoons of chopped fresh basil, pesto, or basil from a tube. Simmer over low heat until the sauce looks dry. 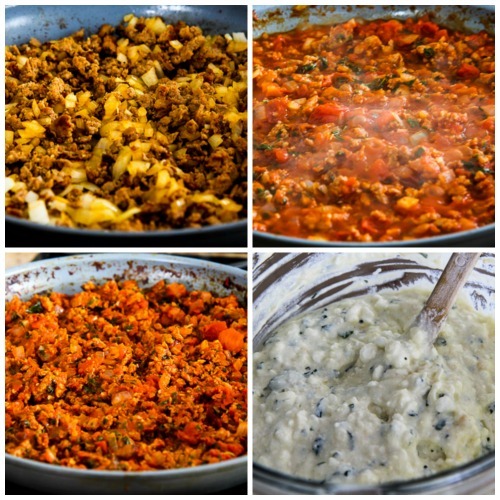 While it simmers, mix together the 2/3 cup grated Mozzarella, cottage cheese, ricotta, eggs, 2-3 tablespoons basil, and freshly grated Parmesan to make the cheese mixture. While the sauce simmers, cut 4 or 5 red peppers into quarters lengthwise, removing the stem end and seeds. Put peppers on a baking sheet and broil just until the skin of the peppers is mostly black. Immediately put peppers into a plastic or glass bowl and cover with cling-wrap; let them steam for 15 minutes. Then peel off the skins and discard. Spray a large casserole dish with non-stick spray a make layers of half the roasted peppers, half the sausage sauce, half the cheese mixture. Then make a second layer of the other half of the roasted peppers, sausage sauce, and cheese mixture. Top with a little more grated Mozzarella and Parmesan. Serve hot, with more grated Parmesan to add at the table if desired. This recipe stays good in the fridge for at least a week, or it can be frozen, and it reheats beautifully. I’d love Kale and Romaine Caesar Salad served on the side for a low-carb meal. Heat the olive oil in a large deep frying pan, squeeze the turkey Italian sausage into the pan and cook over medium-high heat until the sausage is nicely browned and all liquid has evaporated. Break it apart with a turner (or use an old-fashioned potato masher) while it cooks. When the sausage is brown add the diced onion and minced garlic and cook 2-3 minutes more. Add the crushed tomatoes, diced tomatoes, tomato paste, Dijon mustard, Italian Sausage Seasoning (if using), and 2-3 T chopped basil, stir to combine, then turn the heat to low and simmer until most of the liquid has evaporated and you have a thick sauce, about 15-20 minutes. While the sauce simmers, mix 2/3 cup Mozzarella, cottage cheese, Ricotta cheese, eggs, 1/2 cup Parmesan, and the other 2-3 T chopped basil to make the cheese mixture. Make layers with half the roasted peppers, half the sausage sauce, and half the cheese mixture, spreading out the sauce and cheese mixture so it’s even and covers the whole surface. Then make a second layer of each ingredient with the second half of the roasted peppers, sausage sauce, and cheese mixture. Sprinkle the other 2/3 cup grated Mozzarella and 1/4 cup grated Parmesan over the top. Bake 45-55 minutes or until the the casserole is bubbling and the top is browned to your liking. Serve hot, with a little more grated Parmesan to add at the table if desired. Leftovers will keep in the fridge for several days and can also be frozen, and this reheats well. I used Jenni-O Hot turkey sausage for this recipe. I used my frozen basil; use basil pesto from a jar or chopped basil from a tube if you don’t have fresh or frozen basil. We used 4 peppers, but next time I would use 5. If you’re not up for roasting peppers, use 2 jars -12 oz. 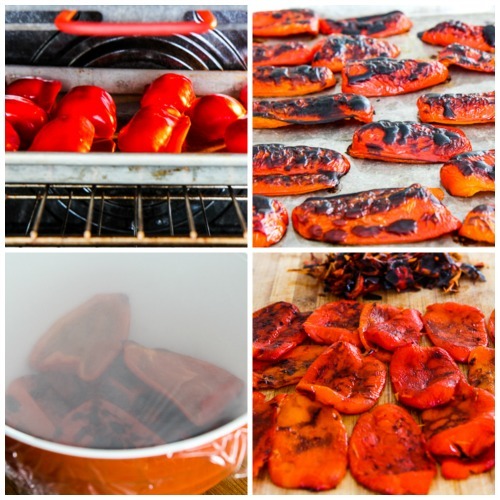 each – of roasted red peppers, drain them well and pat dry. This recipe inspired by Slow Cooker Sausage and Four Cheese Lasagna from The Perfect Pantry and perfected with recipe testing help from Jake and Kara. It would be recommended to use low-fat sausage, cottage cheese, Ricotta, and Mozzarella if you’re making this for the South Beach Diet; other low-carb diet plans would prefer full-fat ingredients. No matter which sausage and dairy products you use, this is a pretty low-carb dish, but there are some carbs in the tomatoes. If you’re really limiting carbs you might skip the can of diced tomatoes. I’ve had this recipe bookmarked for so long, but FINALLY made it this evening. I’m very disappointed…that I waited for so long to make this. It is absolutely wonderful. 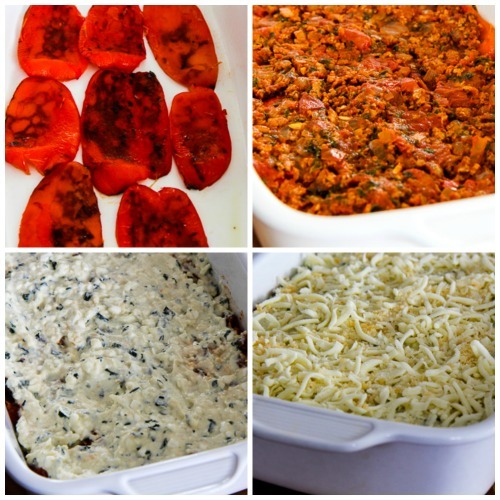 Lasagne without the carb guilt? Ohhhh…yeah, this is (as hubby and I call it) going into heavy rotation. The flavors are spot on, the prep was easy enough, and the dish even looks amazing. Thank you again for sharing yet another fantastic recipe! So glad you enjoyed it! I really like this one too! I can’t wait to try this. My husband is not a fan of cottage cheese. Should I increase the amount of ricotta to make up for omitting cottage cheese or would it be too dry? That should work to use more ricotta and skip the cottage cheese. Of course I haven’t done it that way so I can’t say for sure, but I think it will be fine. Is there any substitute for the cheese? Just found out I can’t tolerate milk like I use too. Sorry but I don’t have any experience with cheese substitutes. I gave this a shot and I loved it. It is definitely a keeper for me. I froze about 1/2 of this since I am the only one eating low-carb in my family, and I would say it tasted just as good after re-heating. Still have some in my freezer which will make a great meal next week. I was a little leary about roasting my own peppers, and I did not quite get them blackened enough and the skin was a little tricky to peal off. Thanks for the great recipe. So glad you enjoyed it so much! Even if they are a bit of a pain, roasting your own peppers is so flavorful. Thanks Alice, so glad you guys enjoyed it! Now you know I will have to try this version — it looks fantastic! And thanks for trusting my original recipe to serve to your family. Lydia, your lasagna was fantastic. And this one is really good too for a low-carb version with similar flavors. Have fun with the new stove! Oh, this looks so great! I have to give it a try! Looks delicious!!! Do you think I could cook it in my casserole slow cooker? If so how long?. Deborah, I haven't tried it but I don't think I'd recommend the casserole slow cooker for this dish. Since there is no noodles to absorb the liquid, I think it will come out watery in the slow cooker. Sorry! Looks delicious! Love that it's low carb I will have to give it a try.